1964 will be remembered within the club as a year of 'revolution'. Long eluded titles in both adult and juvenile level were scooped to bring Cratloe back up in the pecking order of Clare Hurling. Indeed the club's cherished successes at Intermediate level of the 1970's can be attributed to the turnaround that took place in 64'. Cratloe's juvenile team won the Second Division County Championship overcoming O Callaghan Mills at the final hurdle. 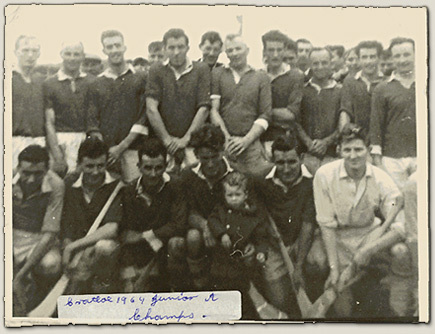 Seamus Reidy captained the team. S. Keyes, T. Mangan, C. Carew, N. Diggins, G. Quin, M. O Neill, J. Browne, S. Reidy (Capt. ), C. O Neill, M. McInerney, E. O Neill, G. Quain, S. Boyce, J. Mangan, J. Hayes, P. McInerney, P.J Ryan, S. Fitzgerald, A. Considine, S. McInerney. It had been 19 years since Cratloe since Premier honours had been carried back to the parish, and nearly thirty since the last Junior A victory. In 64' however Cratloe defeated a strong outfit from Eire Og of Ennis. Liam O Shea was the winning captain and Cratloe were once more junior kingpins. K. Bentley, L. O Shea (Capt. 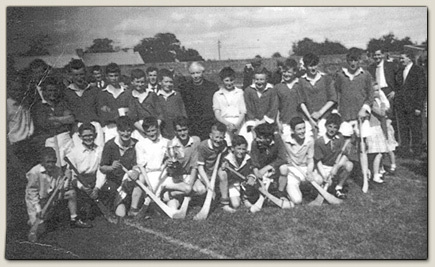 ), G. Bentley, P. Quinn, F. Carew, M. O Gorman, S. Quin, J. O Gorman, N. O Halloran, G. Moloney, T. O Halloran, J. Carew, A. Kinnevane, J. O Neill, P. Considine, S. O Brien, C. Moloney.